Christmas is a joyous time when we celebrate with family and friends. Those of us who have dogs include them in our holiday festivities. After all, they are part of our family and we want them to enjoy the holidays as much as we do. Like small children, dogs are curious, so it is your responsibility to puppy proof your home. This means keeping your dog safe when Christmas decorations come out of storage, Christmas trees are put up, and extra food is set out. Dogs love to explore, and all of these things can be a danger to your dog. Some can cause severe illness and may even be fatal. Prior to Christmas, when you are decorating your home and wrapping gifts, be sure to use caution. If you are using adhesives or glue, keep it away from your dog. Glue and adhesive seem to lure pets, but glue is extremely toxic to dogs. 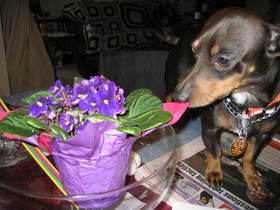 Potpourri oil is toxic to dogs. However, they will lap it up in generous amounts if it’s left within reach. Keep ribbon, string and yarn away from your dog. If swallowed, these items will twist around your dog’s intestines. Expensive surgery will be required, and your dog could even die. Also, never put a ribbon around your dog’s neck. 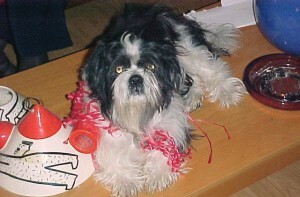 Place candles on high shelves, away from curious noses and wagging tails. Your pet can be seriously injured if a candle ignites his tail or his fur. Emergency treatment for dogs with burns is costly and if the burns are severe, they can be fatal to your pet. I learned firsthand that camera film can be dangerous to dogs. Our Alaskan malamute ate an entire roll of film when he was just over a year old. We had gone out, and not only did he knock the tree down, but the film was completely gone. We phoned the vet and had to take him in for x-rays then watch him carefully for signs of distress from eating the film. There were no negative side effects, but were were lucky and so was he. If the film had gotten entangled around his intestines, he most likely would have died. Though plants bring color and life into your home, caution should be used when placing them. The berries and leaves of holly can cause discomfort and vomiting. They can also be fatal. Poinsettia sap will blister your dog’s mouth within minutes of digestion. It can also cause other symptoms, such as stomach upset. Mistletoe can, in mild cases, cause stomach upset and in severe cases, heart collapse. It is best for dog owners to use artificial Christmas plants instead of real ones. If you feel you must have real plants, place them on high shelves so your dog can’t reach them. Some dogs will mark the Christmas tree. Others will see ornaments as toys and try to get them off the tree. Very hyper dogs can knock the Christmas tree over. Our Alaskan malamute did this the same year as he ate the roll of film. Dogs may also chew the wires from Christmas lights, which can cause shock or electrocution. Preservatives that some people place in their Christmas tree water have sugar in them, which can lead your dog to drink the water in the tree stand. These preservatives are dangerous to dogs. As is the aspirin that some people add to Christmas tree water. 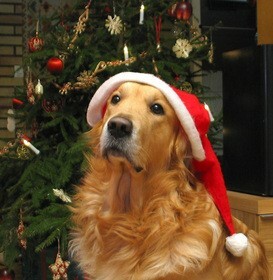 To prevent your dog from drinking the Christmas tree water, make sure that he has water available to him at all times. 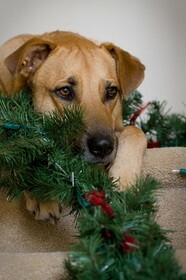 And if your dog is drawn to the Christmas tree stand, don’t allow him in the room where the tree is set up. Regardless of your dog’s breed, whether he is large or small, or how laid back he is, you must take the time to pet-proof the Christmas tree. If you don’t, then you need to keep your dog out of the room where the Christmas tree is set up. This could possibly be done with the use of a baby gate, but some dogs have a tendency to jump over them. If your dog continues to get into the room where your tree is, try placing a barrier such as an exercise pen around the tree. Never leave turkey where your dog can get to it. Why? 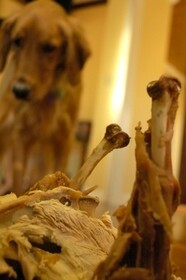 Because turkey bones, like chicken bones, can be fatal to dogs. Can dogs eat turkey meat? A little turkey as a treat is fine, but too much turkey meat can cause canine pancreatitis. Cookie dough should be kept out of your dog’s reach, especially if it has chocolate chips or chocolate by-products in it. Chocolate can be fatal to dogs. Be sure to dispose of all garbage in a safe manner. Items dangerous to dogs (like bones and string) should be discarded in disposable plastic bowls — like margarine containers. Fasten the lid firmly and place in a garbage bag, then put the bag in a tall garbage can or storage bin. There are also some things you can do if your dog gets into the garbage a lot. Just a small amount of alcohol can poison your dog. Keep alcoholic drinks out of reach of your dog, and remind your guests to do the same. And finally, you should train your dog to greet people in a pleasant manner. The holidays are a perfect time to work on this, as a lot of people will likely be coming and going from your home. He should sit and wait to be spoken too. He should not jump on people or lick them. You should provide a safe haven for your dog to escape to when guests are in your home. This allows him to have some peace and solitude and prevents aggressive should he become nervous or irritated by all the commotion. To ensure that your dog enjoys Christmas with you and your family, you are encouraged to take steps now to keep him safe during the holiday season.